Last week the Houston Texans first game against the New England Patriots did not end the way Texan fans’ were hoping. Going into Foxborough and winning is very tough. The negative to take away from last week’s game is the offense and defense struggled, but the positive in my mind is most starters were rusty playing against the Patriots in their home. Most of the Texans did not see a lot of preseason snaps. This week they hope to bounce back as they face a division rival in the Tennessee Titans. 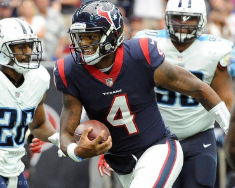 Last year, with Watson leading the charge, the Texans put up 57 points to the Titans 14 points last year. For post season aspirations let’s hope for a big win against a division competitor. Watson looked rusty in his debut, but this week fans should expect a much better outing. Ryan Tannehill posted 230 passing yards, 2 touchdowns, and 2 interceptions. In my opinion Watson is a much better quarterback and should ease the offensive struggles. 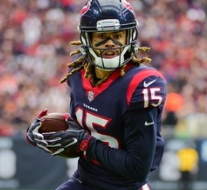 Baring a setback, Will Fuller should be playing this Sunday. He provided Watson with a great deep threat that the Texans have to be excited to get back. Fuller has been nursing a hamstring injury but Bill O’Brien said that he is confident he will play against the Titans. With the rust off, the defense and offense should be expected to put out a much better game. The Texans offensive line will need to step up and keep Watson secure so he can take advantage of the Titans who let Ryan Tannehill have a decent day. The defense is packed with so much talent that it needs to live up to its potential. Blaine Gabbert and a banged up Marcus Mariota will be on the field, this is the perfect situation for the Texans defense to ruin the Titans home opener. This will be the Texans 2nd road trip but they are easily the more talented team. A win here for the Texans is crucial. Currently Jacksonville leads the AFC South and faces the Patriots who they lost to last year in the AFC Championship round. Keeping pace with the division leader will be crucial to make it to the post season. If the Texans can go 1-1 on this road trip, they return home to face the New York Giants in week 3, and then to Indianapolis to face the Colts. I consider the Texans better than both these teams. So they could end up 3-1 if their talent lives up to their potential. Currently work as an Aerospace Engineer and am married with two kids, a boy and a girl! Graduated from ASU with an Aerospace Engineering degree focused on Aeronautics in 2012. Huge fantasy sports fan with my favorite being fantasy football. Most recently got into fantasy baseball. I think fantasy football makes Thursdays, Sundays, and Mondays extremely fun and I look forward to it every year. Also an avid Arizona Cardinals fan. We have the one of the classiest Hall of Famers in Larry Fitzgerald who I love watching play. For the football season I also write for the Fantasy Life Blog and play now in every type of league. I can be found on twitter @rob_r_williams and you can reach me at robrwilliams@live.com.